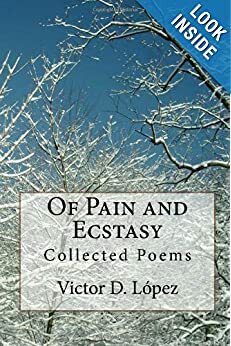 Of Pain and Ecstasy: Collected Poems Free One Last Time 9/17/2013 | Victor D. López, J.D., Esq. I will no longer participate in the Kindle KDP Select Program once my current 90 day period expires this month because I would like to make the electronic versions of my books available in more formats than just the Kindle. As a result, my books will no longer be eligible for free download promotions or be available free of charge to Kindle Prime members after the current 90 day period expires, which for most of my books is at the end of this month. So here is probably the last chance to get this book free of charge Tuesday 9/17/2013. You can download the book free on 9/17 by clicking on its cover below. For that which it may touch yet never keep. And artifice, through artifice, soon dies. To build facades of hope for hopelessness. But it’s too late; its message is too clear.